Sonata is a spectacular Bay Arabian mare with a truly phenomenal pedigree! She is the daughter of MUSCAT, the first Russian Arabian stallion imported to the US and the first stallion in history to win the coveted Triple Crown of Arabian competitions. In 1980, MUSCAT was named US National Champion, Canadian National Champion and Scottsdale Champion! He is also considered to be the leading progenitor of the Naseem sire line. Sonata’s elegance, beauty and athleticism is demonstrated by her correct conformation, dynamic trot and elegant balance. Yet all of these things pale in comparison to her loving and generous temperament! 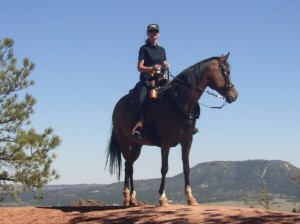 As my first horse given to me by my husband, Michael, over 20 years ago, she is so very special to me!